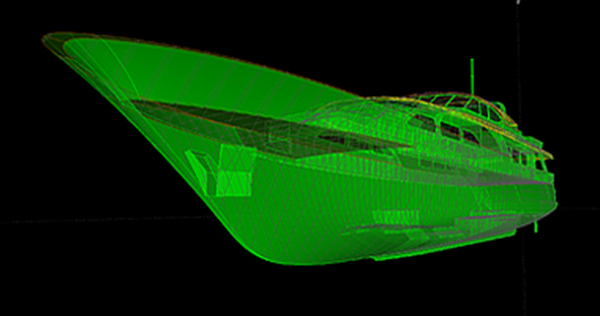 WERNER Yacht Design - an uncompromising focus on combining beauty and performance when it comes to yacht design. Water entices, whether it is an orange sun sinking below the horizon of a mirror-like sea, or the pounding waves smashing into a rocky shore, it always affects you in some shape or form. It might be calming, or outright exhilarating, but it is always inspiring. It clears your mind, leaving room for new plans and ideas. 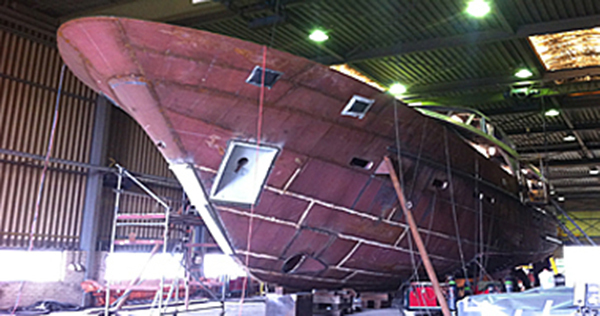 And for some, it is the spark that inspires them to embark on a new adventure: building their own perfect motor yacht. Over the years we have had many clients visiting our office in Volendam in search for their perfect motor yacht. And with most of them we have developed a personal bond that lasts for years. We are proud of that. Proud that people have put their faith in us whilst in pursuit of their dream. This has led, to numerous custom designs. Some elegant, some sturdy, some classic, some contemporary. But no matter what the style we apply, we have put our hearts and souls into every single one of these designs, as if we were designing the yachts for ourselves. This is, after all, our only frame of reference. It is not difficult to work out how you are going to use your new yacht. It is more complicated to establish the X-factor that makes you fall in love with your yacht to-be. It is crucial for us to get to know you. We have to find out what makes you, you. During the initial meeting we often talk about all sorts of things, leaving the discussion about the new motor yacht until the very last. Listening carefully, we get a feel of what you are looking for, leaving you in awe when presenting you with your new design. With this portfolio we hope to inspire you to, and perhaps pave the way for you to pursue your own dream yacht, enabling you to explore the wonders of the blue seas, as many have done before you. 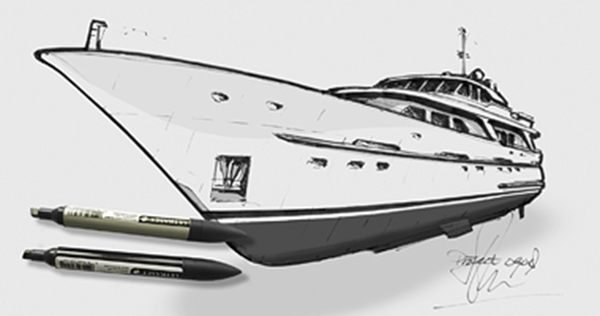 When I first created Werner Yacht Design in 1997, I was convinced that yacht designing had to be approached differently from what I had seen around me. The demands of the interiors seemed to dictate the look of the exteriors. Furthermore, in extreme cases, styling would come last, rather than being the starting point of the design. In my opinion, one has to establish the styling first, and then design the exterior and interior layouts simultaneously - without preference for one or the other. We find a style that suits the client and apply this consistently and in harmony with the design. Meanwhile, we respect the limitations of an optimum lines plan as well as the size of the human body regarding optimum interior dimensions. When it is not possible to fit in all the client’s wishes, we always advise to scale up the overall dimensions of the yacht a little. A few percent extra in length can make just enough difference inside, whilst the good looking hull and superstructure lines remain. And that is what it’s all about after all; the result should always be stunning. The yacht, once launched, shall attract the eye of every passerby. 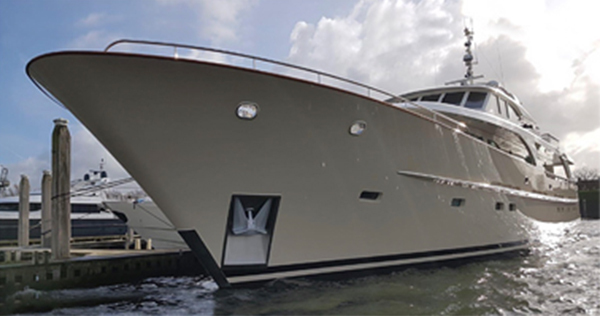 Salutation Make your choice Mr. Mrs.
WERNER Yacht Design is member of the Netherlands Society of Yacht Designers and Naval Architects, and is bound to the Terms and Conditions of the society. You can download the Terms & Conditions of the socienty by clicking the download button.